You are currently browsing the The Pet Product Guru blog archives for the day Wednesday, November 14th, 2018. If you were to design a cat that was perfect for cold climates, you probably couldn’t come up with a better cat that mother nature has already designed. The Norwegian Forest cat. This is a very old breed that used to roam the seas with the vikings. It has a beautiful long double coat that changes to fit the seasons. The outer layer is waterproof, ready for harsh snow and rain. The cats tail is long and bushy and its ears have long tufts for extra protection. 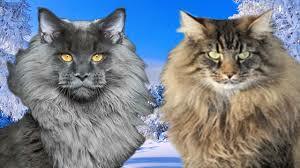 It’s interesting, but the Norwegian Forest cat does not require a lot of grooming. It also makes a wonderful house pet that is good with children and other pets. So if you’re considering a cat, buy those cat treats and cat toys for your Norwegian Forest cat! The best oldies are always on Edgewater Gold Radio! Oldies variety play all the time on Edgewater Gold Radio. Listen from our website: Edgewatergoldradio.com.